Seasons Greetings from Kent! Do you feel like Christmas has come early this year?!? I know it’s a fixed point on the calendar, but it seriously feels like it’s earlier than usual this time around! This is partly because it’s been an extra-busy fall for our family… partly because I’m just getting older and the years seem to go by more quickly every year… and partly because of the fact that Thanksgiving fell on the earliest possible date on the calendar… But in any event, it’s that time of year to say: We wish you a Merry Christmas and a Happy New Year! Seriously. We hope you’re doing well. 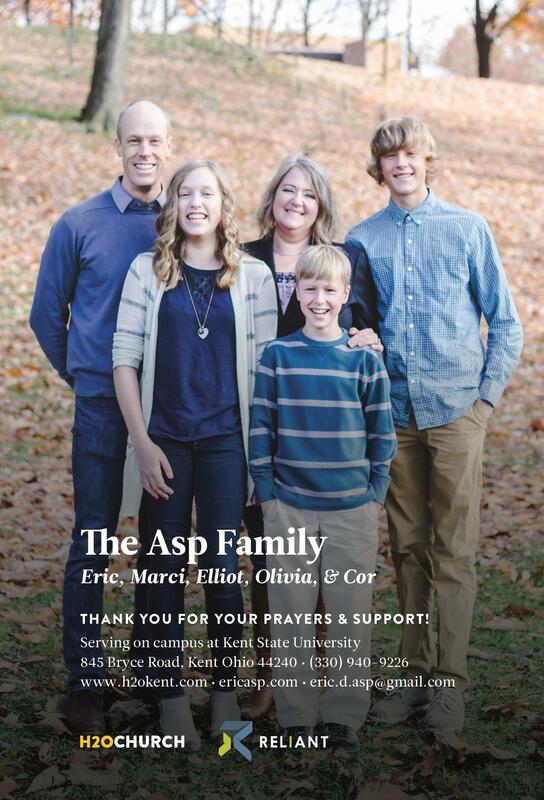 The last year has brought much continued growth and grace for our family — as you might be able to see in the new family picture / prayer card we’ve enclosed — still we’re doing well, and our ministry at Kent State is doing well, too. A lot of people are working on their Christmas shopping these days. The students of H2O Kent are doing this, too — with a bit of a twist. As we get into the Advent season this year, our church is renewing an annual tradition we call the Immanuel Project. This initiative developed a few years ago when our church started praying for ways to get involved in the community of Kent, in addition to the campus of Kent State University. We wanted to find a way to bring about Gospel renewal by meeting the tangible needs of those in our community. Since 2014, we have developed some key relationships with children and parents in the south-central neighborhoods of Kent, surrounding Holden Elementary School. As connections with this particular school have developed and strengthened, we have partnered with the Ben Curtis Family Foundation and Holden Elementary to provide for the needs of these children and families. It’s kind of like sending a shoebox stuffed with Christmas presents to a child dealing with poverty in the developing world, except that the child is from a family dealing with poverty right here in Kent — just a few blocks away from the places where students live. We believe that the Immanuel Project is a direct, tangible expression of the fact that God is with us (Immanuel). Before heading out for their Christmas shopping, our Life Groups gather together to read Matthew 25:31-46 and talk about how our actions towards the “least of these” are ultimately expressions of love for Jesus. We hope that as our church heeds the call to care for the oppressed, maligned, and impoverished, we exemplify Jesus’ heart for His creation and proclaim that a new world is coming when things will be set right. We believe that we are participating in these realities as we care for these kids at Holden Elementary. It’s encouraging to look back over the last year and recognize all the different ways that we’ve experienced God with us, in our ministry! God is present when small squads of H2O church members share the love of Jesus with students stumbling from house party to house party on University Drive, late on a Thursday night… Marci and I recognize God with us when a young couple shares about the struggles of their new marriage and we offer counsel, support, and prayer… God’s nearness is palpable when our church gets to celebrate a freshman’s baptism, out along the main thoroughfare that runs through the heart of campus… It really is beautiful and miraculous to proclaim: God is with us! I wish I could package up all these moments and send them to you as a special Christmas present. It’s amazing to realize the way that your prayer support and financial support are helping to touch so many lives. A special gift. An additional gift of $500, $300, or $100 at the close of the year is a significant way that God provides for our yearly budget, and it will be especially strategic in providing the means for strategic ministry initiatives in the year to come. Giving via LifeLink. If you give regularly by mail, please consider a switch to this easy, automatic, secure service. You can start, stop, or change your giving at any time. Increasing your regular giving amount. A new year means a new missionary budget. We’ve picked up some extra costs and lost some support through natural attrition, and 2019 is going to be a year of shoring up our financial support foundations. We would be blessed if you could help meet our support goals for the coming year. This entry was posted in H2O Kent, Ministry, Prayer, Prayer Letters. Bookmark the permalink.